Montenegro is a small European nation that not many people know about, but everyone should. Born out of the 1990s war that created the new Balkan nations, Montenegro has benefitted greatly from its tremendous Adriatic Sea location, stunning vistas and old towns. It seems Montenegro gets lost in the shuffle of the European giants as far as tourism goes, but I am telling you that you need to see Montenegro! Make no mistake, the best parts of Montenegro are the small towns and sites on the Adriatic, easily accessible from cruise ships. My favorite town in Montenegro is Kotor. Kotor is a picture perfect place with a well-maintained old town; which is a labyrinth of little streets, shops, cafes and pathways. Just walk around and get lost in the beauty of a true gem. Then don’t forget to hike up to the top of the hill for some stunning views of the only fjords in Southern Europe. The views are to die for but keep in mind, it is a strenuous hike and in the summer the temperatures can get pretty hot with little shade along the way. So bring plenty of water and monitor yourself. Not far from Kotor, is Perast in Boka Bay. This is another great little old town to visit with the highlight being the ‘Our Lady of the Rock’ little island church. There are frequent water taxis that head out to this great site and it should not be missed. The views alone of the mountains surround Kotor Bay are worth it to make you feel really small! Budva is another great coastal town in Montenegro that is very popular with tourists as it should be. Probably my favorite thing to see or do in and around Budva is go to Sveti Stefan or St. Stephen. It is another small island easily accessible from the mainland and is photogenic to a tee. It’s also a popular place with A-List celebrities including the Queen of England herself! Sveti Stefan is a very glamorous place and is not to be missed in Montenegro. Inland from the coast there is also a lot to see and do in Montenegro including some excellent National Parks. I think the two best are Skadarsko Lake and Durmitor. Skadarsko is about a 20-minute drive from the coast. It has a beautiful river that connects the lake to the Adriatic and creates a gorgeous natural setting with lovely mountains breaking it up creating tremendous views. The river is shared between Montenegro and Albania but the best part is in Montenegro for sure. Durmitor is a great place to do fun outdoor activities; you can even bungee jump! The capital of Podgorica is also an interesting place to pop into but I wouldn’t spend a huge amount of time there. The highlights of Montenegro are on the coast and the majority of your time should be spent exploring the old towns and natural beauty. 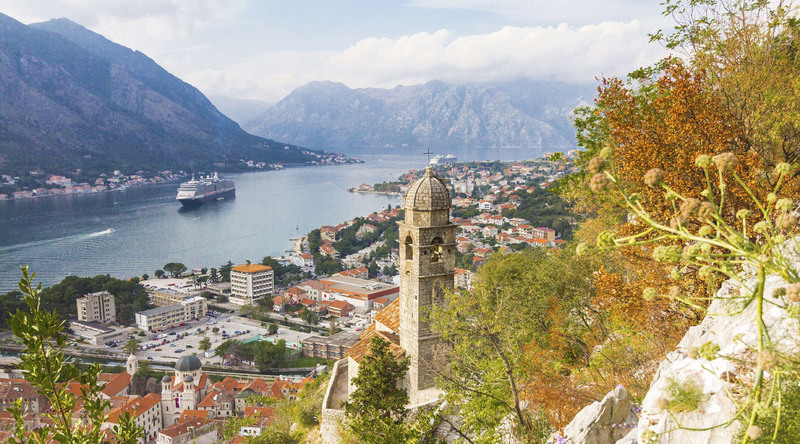 See the beautiful coast of Montenegro with Azamara Club Cruises this Spring. This 10 Night voyage embarks from Nice, France and calls on ports in Monaco, Italy, Croatia and Montenegro. This 7 Night voyage includes many overnight stays and late-night departures in Croatia and Montenegro.